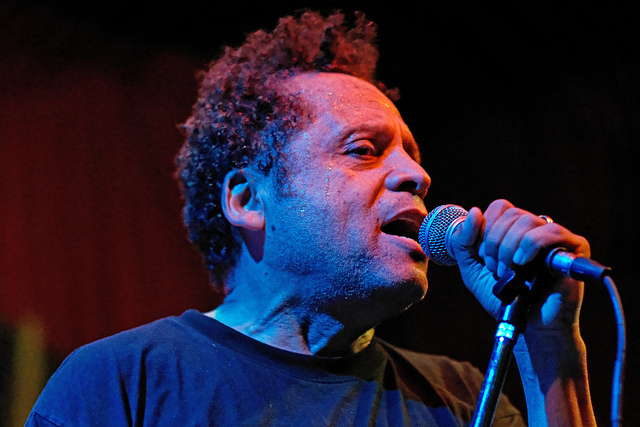 PARIS – In retrospect, I see it as very appropriate that Garland Jeffreys performed his gig in Paris last night at the New Morning venue on the rue des Petites Ecuries. The street was created in 1780 and it was near the royal stables. The thing is, Jeffreys, 70 years old this year, appears to be at the start of a new morning of his life – and you can’t hold this royal stallion down! Noooo regrets. Garland Jeffreys is one of the most unique cult figures in pop music, and at 70 years old, he puts on a show that is so much fun, so cool, so audience-friendly, that I can’t imagine anyone walking out without being touched. Jeffreys is not the greatest singer in the world, his melodies and songs are not epoch making or breaking compositions of extraordinary originality. But all the parts of this guy come together to create a real unique experience. He IS a natural showman, he gives everything he has – sometimes too much for his own good, as when he jumped backwards off a box cube at the edge of the stage and narrowly missed – or actually beautifully hid – seriously damaging his shin on the corner of the box. He leapt the meter or more height from the edge of the stage to the audience on several occasions to be amongst the audience, hug and kiss the women, and generally whip up a storm of great vibes with the audience. It was only in seeing Jeffreys that I could really feel as if I understood something about this guy I knew some stuff about – and knew some of his music – without ever really understanding what he was all about. In fact, again, he is the sum of many amazing parts. A unique character, cult figure, and really a consummate showman. He is also a kind of musicians’ musician: From Brooklyn, he majored in history at Syracuse University with Lou Reed before the latter formed the Velvet Underground. He was friends with Bob Marley, has played along with Bob Dylan, Paul Simon, Bruce Springsteen, Patti Smith, John Cale and even Sonny Rollins. The latter means he wants to keep on playing and performing until he is in his 90s. This little bit I actually heard from him myself in a short conversation after the show. He came out to sign CDs for the spectators after the show and stayed for what I think was around half an hour. But an hour and a half or so after the concert he ended up sitting in the same restaurant around the corner from the New Morning where I was sitting with my friends. So I took the opportunity to speak with him briefly – he was sitting with a group of around 12 people, at least some of whom seemed to be simple fans – although he has many friends in France. He appears, in short, to be going through a fabulous renaissance at age 70, and I didn’t see a single person in that full house of the New Morning who appeared disappointed. For me, the key to Jeffreys IS his personality, his personage, his true emotion, his character, his past, his outlook on life. At a time when Rodriguez has risen out of obscurity at 70 to be a star, there is one point of comparison with Jeffreys: They are both street poets, one of Detroit, the other of Brooklyn. A Comparison Between Garland Jeffreys and Rodriguez? But the comparisons stop there – as Jeffreys’ flamboyance – think Springsteen – is far from that. Oh, yes, Jeffreys has also been the subject of a documentary – directed by Wim Wenders and produced by Martin Scorsese. The great news is that above all some of the recent songs were fabulous – we loved this song he did about his grandmother, also, by the way, which was very, very emotional. With a background like this, with a talent like he has, the biggest question I think I would have after leaving the New Morning last night was not about Garland Jeffreys and who he is and what his talent is all about. It is why 90 percent of the spectators last night had grey hair! In an age when kids in their teens know more pop history thanks to YouTube and the Internet than that which I have spent a lifetime trying to absorb, why is Jeffreys not more on the radar with them?